It is a jovial evening with family, friends, children, laughter, and of course…cake! The pizza sized countdown clock looms large in the background. 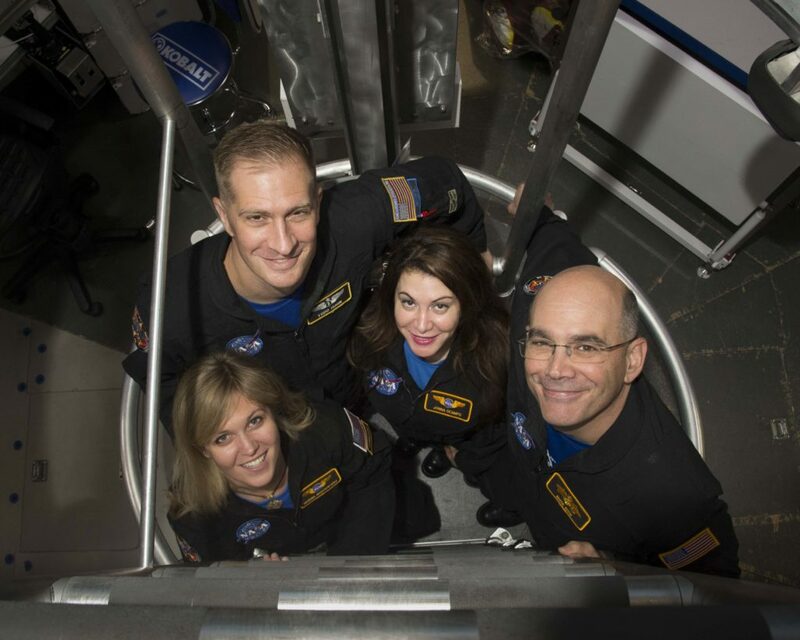 In moments, four crew members will voluntarily lock themselves away in a modest two-floored habitat for 30-days, all in the name of advancing the science of space exploration. The four of them are easy to spot amongst the 50 people in Building 220 at JSC who are there to watch the ingress. They are wearing black flight suits with name and mission patches. I find Todd Huhn, introduce myself, and ask him how he is feeling about the mission. “I’m excited and ready. The time away isn’t as concerning to me as completing all of the assignments scheduled for us. There are a lot of research investigations during this mission,” he said. We continue our conversation when his wife walks by with a three-year-old in her arms. “I’m going to find a corner,” she tells him. He nods and explains to me that its time-out time for the little one. Then he points out to me his two other daughters who are running around with other children they met, all of whom are exploring this unusual place in which they find themselves. I wish him safe travels and quickly find Mark Kerr, the other male of the two male/two female crew. Mark tells me he really likes the HERA website our Human Research Engagement and Communications team created, and explained how he used it to explain to his daughter’s class what he will be doing for the next month. With twenty minutes left on the countdown clock we are summoned to the cake room for some last words of wisdom. Kraig Keith, Flight Analogs Deputy, declares the crew fully trained and qualified for the mission at hand. Flight Commander Ulyana Horodyskyj cuts the cake which depicts the Mission XII patch. With less than five minutes to go, the crowd gathers near the habitat and makes a human pathway reminiscent of the parent tunnels formed at the end of soccer games. That’s when I notice one of the crew is missing. I scan the room to find Todd leading his wife and three daughters over to the side of the habitat. He squats to their eye-level and speaks to each one before giving them a hug and a kiss. Then he held his wife. The journalist in me was inclined to snap a photo. The human in me won out and decided to leave their private moment private. Todd joins his fellow crewmembers and as the clock races down to 0:00, they jog through our makeshift tunnel and stop at the door to the vessel. With a traditional ringing of the bell, the HERA vessel is officially turned over to the crew by Patrice Yarbrough, HERA Principal Investigator, for their mission. She rings the bell three times for Campaign 3 and then another four times for Mission 4. Ulyana, Todd, Jonna, and Mark step inside the habitat. They wave one last time and the door is close. There is an instant drop in the atmosphere of the room once the door closes. A sound absorbing padding is placed over the door and Building 220 seems silent and empty. “See yain 30 days,” I thought to myself.